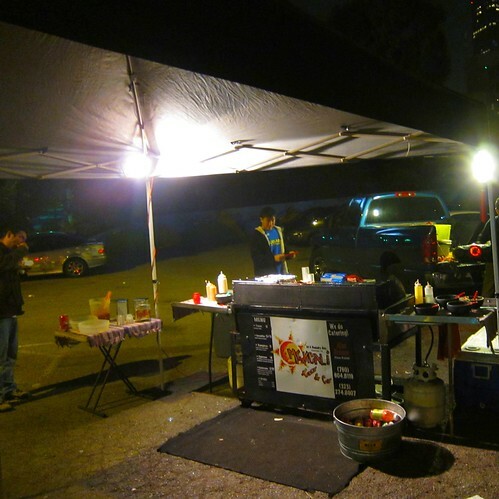 By now, anyone who likes tacos and lives in Los Angeles has heard of these guys. They’ve been slinging LA’s best carne asada tacos for a couple years now in downtown LA at the corner of Beaudry and 1st. The secret? Better quality meat, better salsas, and a fresh off the grill taste wrapped in a fresh tortilla. Tacos are $2 each and come loaded with meat (carne asada, pollo,chorizo), The carne asada is diezmillo, a better cut of meat than ranchera, which is the cut you will find at most LA taco stands. The salsas are all very good. 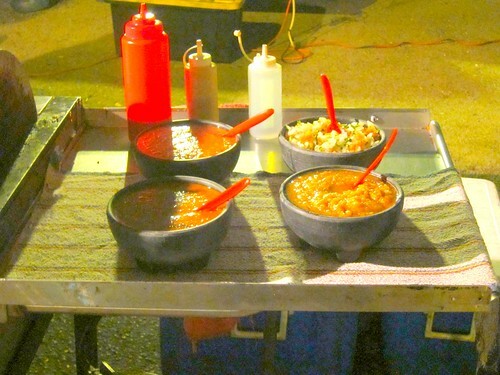 Try the habanero and tomato salsa or the chipotle salsa. They also have a pico de gallo and a guacamole salsa for baja purists. I started with two tacos(carne asada and chorizo) and garnished them from the salsa molcajetes. The chorizo was paired with the habanero salsa, the asada the milder chipotle salsa. Both were excellent, the heat from the habanero made my forehead sweat a little. The carne asada was full of flavor and had that fire grilled taste. After finished the first two tacos I ordered two more carne asada, this time applying the habanero to both as well as the delicious red onion mixture. I’m not sure the red onions are meant to be rolled up into the tacos but the flavor combination was really working for me. The heat from the salsa and the onions combined with the fire-grilled flavor of the meat had me wondering if I’ll ever go back to taco trucking again. 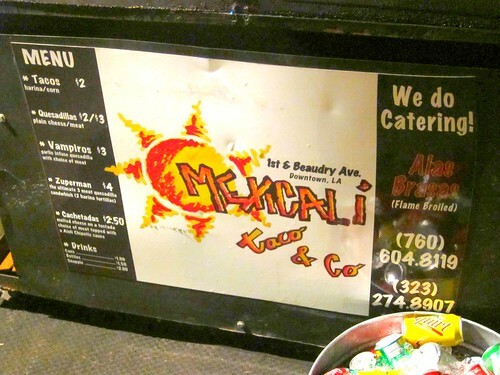 I was too stuffed to try Mexicali’s other creations. There is the vampiro, a hybrid taco-quesadilla stuffed with meat, cheese, and chipotle salsa. The cacheteda, a flat taco with a crunchy tortilla topped with meat and salsa, and the zuperman; two tortillas that sandwich in all three meats with cheese and salsas. 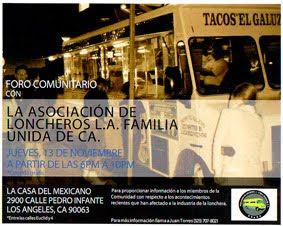 Mexicali Taco Co sets up Wednesday through Saturday 8:30pm until the meat runs out. On my first two attempts to try Mexicali and Co they had run out of meat but this time I was early and made sure I wouldn’t miss out again on LA’s best pop-up taco stand. 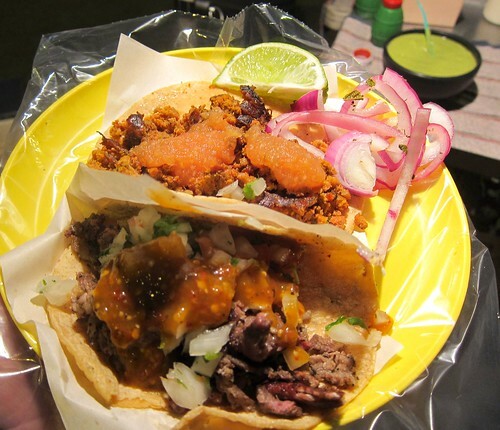 Mexicali Taco Co and Mariscos Jalisco are in the final of LA TACO's TACO MADNESS. Voting ends Thursday so don't forget to vote for your favorite taco spot! I went here after a Dodgers game....was not good. Maybe things changed? try the sanchos. so good -- jalapeno stuffed with cheese, wrapped in bacon, and then grilled. the best. Best in LA ! These tacos are good but you can make them better by adding www.stvendors.com " YOU HAVE TO TRY IT "
This is definitely not a review in favor of Mexicali Taco & Co. I have been visiting this site since it's conception and to my astonishment the quality and degree of service was not to my standards and to the extent of a five star rating. As a matter of fact, the rating for this location is below restaurants standards. The cost of dining at the site of a parking lot is more than what it will cost you to dine at King Taco. The meat is the lowest grade you can buy and the extra charges (such as the special house sauce "chipotle") are not very welcoming when they are not noted visibly and are announced to the customer at the point of payment - instead of retaining their existing clientele they are driving them off. 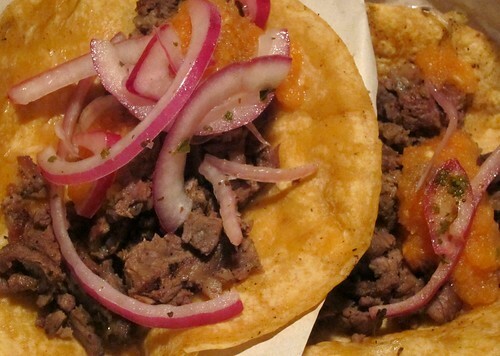 Bypass this location and find a taco shop that will satisfy your taco needs. I was frankly underwhelmed when I hit the Figueroa location the other day for lunch. I mean, the asada was good but hardly life changing. I enjoyed my chorizo catchetada a bit more, but again, nothing life changing. I honestly prefer the tacos at Tacomiendo. I also think I'll be sticking with a burrito al pastor at Carnitas Michoacan before Dodger games.